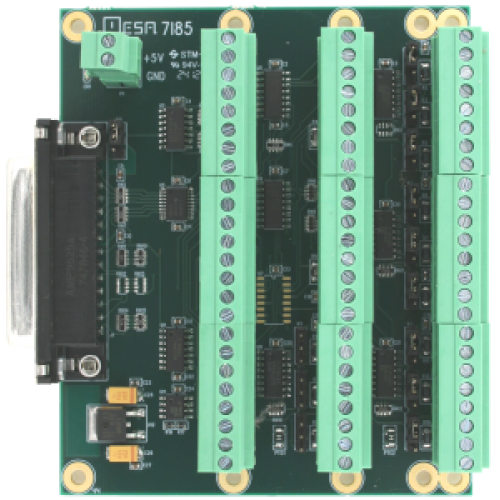 The 7I85S is a four channel encoder plus 8 differential output plus one channel RS-422 interface for Mesa's Anything I/O series of FPGA interface cards. The 7I85S is designed for motion control applications. 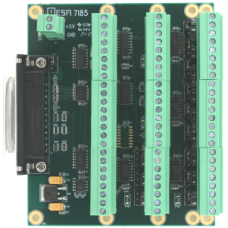 The 7I85S has four TTL or differential encoder inputs including index, eight differential ouputs that can be used as four differential step+ dir output pairs or PWM outputs or other output functions. One RS-422 serial interface is provided for I/O expansion. The controller connection is a DB25 connector that matches the pinout of Mesa's 25 pin Anything I/O cards. All buffered I/O is terminated with 3.5 mm pluggable screw terminals (supplied).